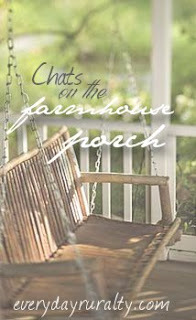 I missed Patrice's chat last week, but I'm glad to be joining herself and the other ladies on the porch this week. 1. How many loads of laundry do you do each week? I haven't a clue of the number, Patrice. We have smaller washing machines over here than you have in the USA. Our machine is a 6kg, but I do think yours are considerably larger. Over the past few days, my washing machine hasn't stopped. DR spent the past two weeks in Inverness on a course for the Fire Service, and the washing that came home with him was ... well, you can imagine! Added to the 'normal' stuff, it has meant I've dealt with Mount Everest this week, rather than my normal Ben Nevis. 2. Where do your household pets sleep? Jackson discovered the shoe cupboard about three weeks ago. We always kept the door of this cupboard well and truly shut when he slept in the Utility Room, thinking he'd chew every shoe there! But, one day, he nosed his way in, lay in the corner, and has never been happier or more settled. This cupboard/room backs onto the wall where we have the stove, so it's very warm and cozy.... That probably explains his delight at the find. 3. What is your favourite thing to listen to whilst driving? If I'm on my own, I like ... well, hang on... you know, it actually varies. At times, I enjoy silence - after all, that's a gift I don't get too much of. Often, I listen to a sermon, and other times, I listen to music. I never tire of Vivaldi's Seasons, and it brightens my day and gives me the oomph I need at times. 4. Do you have to do a big clean-up when you have company, or are you always ready for guests? It makes me ready to face the evening. 5. What's your favourite breakfast food? Well, I am very boring with breakfast food. I simply have tea and toast. The kids mostly have cereal - Weetabix and Cornflakes or Krispies - always Kellogs: I'm told that is very important. 'Why not the cheaper brands? ', I ask. 'They are awful! ', I am told. The Builder takes porridge most of the time, and when the kids were younger, that's all they ever had. Sadly, they are now onto the flavoured cardboard - aka boxed cereals! Over the past couple of days, I've made a few batches of these Banana Muffins. The muffins themselves are so soft, and eaten along with the crunchy topping makes this the yummiest banana muffin I've made until now. The topping reminded me of Laurie's Coffee Cake. Do y'all remember the Coffee cake - the cake that's called a Coffee cake but has no coffee? Read about how we first discovered Coffee Cake, and find Laurie's recipe here. Those muffins look amazing. Yummy! I love banana muffins. The crumb topping only adds to it. Coffee cake is what you eat while drinking coffee, but I'll join you if you serve those delicious looking muffins. Smiling at your answers. Yes, that was our delicious discovery ... the 'coffee' is in the cup, not in the cake! I like banana muffins. I am never ready for guests. I guess I could blame it on a war between the "dust bunnies", but folks would never believe me! Sorry to hear about email problems. My oldest was going to try to reach you. Please email me with an alternate email if you have it and I will pass it on to her. Otherwise, I will just have her wait until she is about to travel. Have a good week! I'm keeping the email address for now, Patrice ... If nothing else happens, I'm hoping it'll all settle down. Hah - war between the dust bunnies ... Mine just looks too like an all-out battle zone! Sherri, the crumble definitely makes the difference. It is SO delicious! For those unexpected guests (which we LOVE to have)..code words, "twenty three nineteen" from the movie Monsters INC. move us to action. We can generally get the big downstairs area...habitable in a very short time. 23-19 ... hilarious! We need something like that here! I'm always ready for company. Ha ha! Very good answer! Yep. We do lots of laundry here, too, and our washer is quite large. It seems to almost never end, but occasionally there is a day (barring Sundays--they dont count) when there is not enough dirty laundry to run a load. Gasp!